It looks like fans of the Red Dead series may have a new game to look forward to as Red Dead Redemption 2’s map has leaked onto the web. There has been some murmurs about a new Red Dead game in recent months but reports this week claim that the new Red Dead game will be set before the events of Red Dead Redemption, which launched on the Xbox 360 and PS3 several years ago. The map image was posted to NeoGAF by someone claiming to be in touch with people who have knowledge of the game and its development. 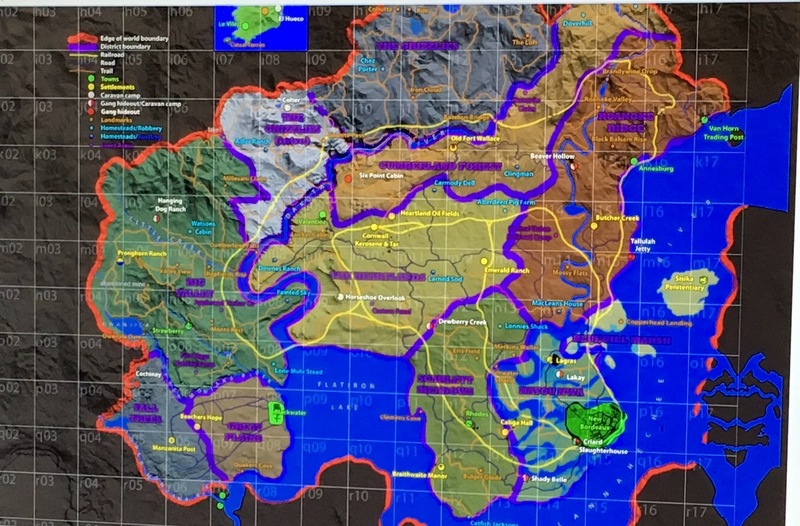 Once the image was out there, TechRadar got in touch with its own sources, who claim that the leaked map is in-fact real and actually fairly recent. At the bottom left of the map you can find the Great Plains, which is part of where the events of Red Dead Redemption were set. However, you will notice that there is no railway going through it, which could class as evidence pointing towards an earlier setting. Rockstar has not officially announced Red Dead Redemption 2 at this time but if these leaks are accurate, then perhaps we will see something official at E3 this year. KitGuru Says: We didn’t get Red Dead Redemption on the PC but the game gained quite a few fans on console. Did any of you play through Red Dead Redemption? Would you like to see another game in the series? Nothing about RD3 yet, just an RDR video. This needs to be updated with nothing but news on RDR backwards compatibility or RDR2 info. Hopefully there will be news about both at E3. I hope so. The fact that people have played RDR backwards compatible on XB1 is frustrating. I'd buy it again to have it digital on XB1. I'd actually forgotten about the backwards compatibility stuff until you mentioned it. I could be playing it now that I have an Xboner. Dr. Zoidberg wrote: I'd actually forgotten about the backwards compatibility stuff until you mentioned it. I could be playing it now that I have an Xboner. They put a stop to it because it wasn't officially released. The persistent rumor is that Rockstar was scheduled to reveal Red Dead 3 at Sony's show - but pulled out due to the Orlando tragedy (potentially feeling uncomfortable with the timing). That's why Sony's show ended somewhat unceremoniously, on a gameplay demo of a title announced at the start of the show. They had to reorganize to fit the new order. Today we're happy to announce that Red Dead Redemption will be released as part of Microsoft’s Xbox One Backward Compatibility program this coming Friday, July 8th. Stay tuned to the Newswire for more details. People really, really wanted to play this. Red Dead Redemption will be playable on Xbox One as of this Friday July 8, and it looks like everyone is itching to head out west again if the increase in sales on Amazon is anything to go by. At the time of writing, sales of the Xbox 360 title have risen by over 6,000% in the last 24 hours following the backwards compatibility announcement, while sales of the Game of the Year Edition are up by over 2,000%. “Starting on Friday, every Red Dead Redemption Xbox 360 owner will be able to play the game directly on their Xbox One, regardless of which version of the game they own,” said Rockstar. You can also grab it through the Xbox One store. So I have it on disc from when I played it on 360 but I'm just going to buy it digital now so I can download it to my XB1. For those that don't want to watch the video, RDR runs smoother on the Xbox One than it does on the 360 and with no screen tearing. Downloading it now so I can play it on the weekend! Anyone tried it yet? Mine completed this morning, I've grabbed all DLC except Undead Nightmare but the game won't load. It says it's not out yet. I downloaded the digital copy, not using disc. I don't believe you. Microsoft would never screw you around. Skynet wrote: Anyone tried it yet? Mine completed this morning, I've grabbed all DLC except Undead Nightmare but the game won't load. It says it's not out yet. I downloaded the digital copy, not using disc. Haven't tried it yet. I will later. Iced Coffee Man wrote: I don't believe you. Microsoft would never screw you around. They didn't. It's just the instructions weren't clear. It said restart the console, which I did. The console needed a hard reset. Once I did that it worked fine. What I also like is that it doesn't suffer from the same frame drop issues the last gen consoles had. I've played it for a little bit. I really should get around to finishing it but man I had fun in multi.